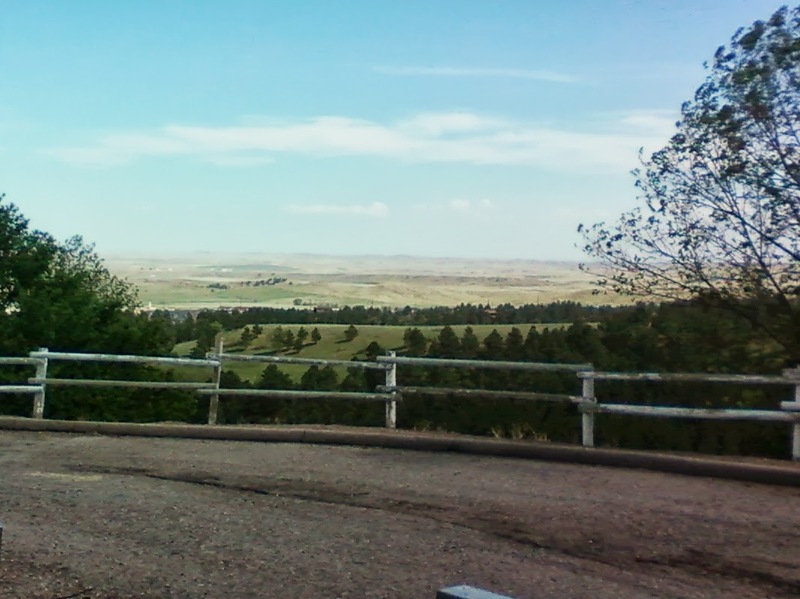 We woke up on a beautiful June morning overlooking Rapid City for what was to be the last time on this very steep hillside that had been carved out for the RV Park. I wasn’t going to miss the steep climb to the laundry or to walk the dog but I was going to miss this wonderful city with all of its history. After a hot cup of coffee overlooking the hills and ravine surrounding us, it was time to get to work sliding in and hooking up the rig. We are slowly getting better with getting everything ready to go; instead of three days, we’ve gotten it down to two. I know to some of you this may not seem like a very big accomplishment but to us it is. Can you imagine packing up a two bedroom house with all of your belongings and getting it loaded on the truck in a matter of only two days? I can’t either, that is why I am happy about our being able to do this in our rig, much faster than a year ago when we started full timing. One very important lesson we learned at this park; bed rails on your tow vehicle are NOT a good idea. They look good when the truck is unhooked and riding alone but when you get it in a pinch they will do some damage to the underside of your fifth wheel rig. Yep, you guessed it! While pulling out we put a small hole in the underside of the rig that has treated us so good on this journey. The hole was smaller than my hand and we were out of time at this park meaning there was no time to call the insurance company and wait for repairs. It was time, for better or worse, to hit the road again. Seeing as we had already traveled this same exact path only a month before, I didn’t bother with dragging out the camera for pictures. There wasn’t much that had changed in the scenery in these past few weeks. The lil one settled down with a movie and we got ready for a long, boring, monotonous 6 hr. ride across the state of South Dakota again. We were heading from the very west side of the state back to the very east side, back tracking like this is not the norm for us; but work required it. We had run through all our saved funds for this particular trip in these quickly passing four weeks, but we did get to see and do all the great things Rapid City offered us as tourists. On the lil one’s list of accomplishments was getting to see buffalo at Custer State Park, Mount Rushmore Monument and the most impressive site being Crazy Horse, as her bloodline ties her to this site. She did learn the faces on top of Mount Rushmore and to this day can still tell you the first President of the United States. If we can experience it firsthand the knowledge sticks in the ever growing brain we are feeding. After a very long day traveling up and down the rolling hills of I90, sometimes not even making it up to 45mph going uphill, we landed in a small town outside of Sioux Falls. I had researched the area previously and quickly found that they didn’t have very many RV Parks to suit our needs. This time we decided to stay just outside of the city in a small town called Tea, this ended up being one of the best parks we had been in to date.